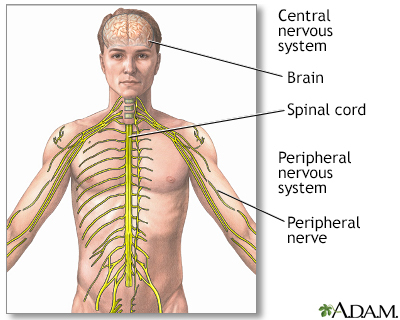 Ganglioneuromas are rare tumors that most often start in autonomic nerve cells. Autonomic nerves manage body functions such as blood pressure, heart rate, sweating, bowel and bladder emptying, and digestion. The tumors are usually noncancerous (benign). Ganglioneuromas usually occur in people over 10 years of age. They grow slowly, and may release certain chemicals or hormones. There are no known risk factors. However, the tumors may be associated with some genetic problems, such as neurofibromatosis type 1. A ganglioneuroma usually causes no symptoms. The tumor is only discovered when a person is examined or treated for another condition. Symptoms depend on the location of the tumor and the type of chemicals it releases. Blood and urine tests may be done to determine if the tumor is producing hormones or other chemicals. A biopsy or complete removal of the tumor may be needed to confirm the diagnosis. Treatment involves surgery to remove the tumor (if it is causing symptoms). Most ganglioneuromas are noncancerous. The expected outcome is usually good. A ganglioneuroma may become cancerous and spread to other areas. Or, it may come back after it is removed. If the tumor has been present for a long time and has pressed on the spinal cord or caused other symptoms, surgery to remove the tumor may not reverse the damage. Compression of the spinal cord may result in loss of movement (paralysis), especially if the cause is not detected promptly. Surgery to remove the tumor may also lead to complications in some cases. In rare cases, problems due to compression may occur even after the tumor is removed. Call your health care provider if you or your child has symptoms that may be caused by this type of tumor. Goldblum JR, Folpe AL, Weiss SW. Benign tumors of peripheral nerve. In: Goldblum JR, Folpe AL, Weiss SW, eds. Enzinger and Weiss's Soft Tissue Tumors. 6th ed. Philadelphia, PA: Elsevier Saunders; 2014:chap 27. Haithcock BE, Zagar TM, Zhang L, Stinchcombe TE. Diseases of the pleura and mediastinum. In: Niederhuber JE, Armitage JO, Doroshow JH, Kastan MB, Tepper JE, eds. Abeloff's Clinical Oncology. 5th ed. Philadelphia, PA: Elsevier Saunders; 2014:chap 73. Reviewed By: Amit M. Shelat, DO, FACP, FAAN, Attending Neurologist and Assistant Professor of Clinical Neurology, Stony Brook University School of Medicine, Stony Brook, NY. Review provided by VeriMed Healthcare Network. Also reviewed by David Zieve, MD, MHA, Medical Director, Brenda Conaway, Editorial Director, and the A.D.A.M. Editorial team.